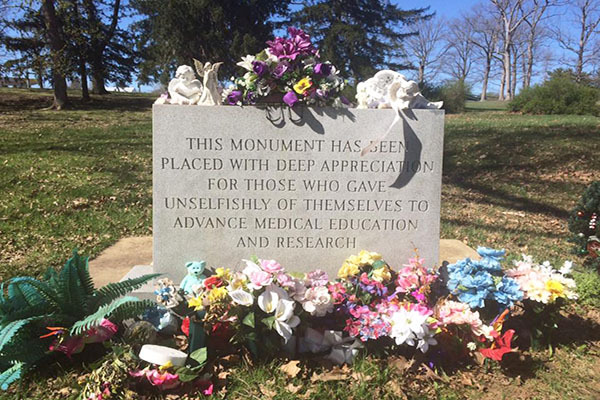 This monument rests above the ashes of Maryland body donors and unclaimed "donors by circumstance," in Sykesville, Maryland. Her grandmother’s ashes rested on the hearing-room table in what resembled a wooden jewelry box. By the end of the hearing Sinclair hoped she would have more than charred remains to show for her Mom-Mom’s legacy–she would have the beginnings of Nancy’s Law. Named after Nancy Porter, the bill, HB1152, which died in committee this year, sought to extend the grace period from three to 14 days before an unclaimed body becomes Maryland property and is released for use in medical science. It would also grant any willing relative or friend the right of final disposition–a notion that made Maryland funeral directors cringe and envision hundreds of grief-filled lawsuits fighting over who has rights to a body. Though Nancy’s Law never went further than five minutes in a committee hearing and a Facebook page started by Sinclair, it exposed a little-known rule about what happens when you die in Maryland without a will. According to Maryland law, there are four ways to dispose of a body: burial, cremation, donation or shipping outside of Maryland to either another state or country. Based on a vital statistics report from the Department of Health and Mental Hygiene, there were 45,688 deaths among Maryland residents in 2014. Most were buried in a traditional casket. Still, more than one-third opted for cremation last year, according to the Maryland Board of Morticians and Funeral Directors Executive Director Ruth Ann Arty. Arty has headed operations for six years, including a time when crematories and body transporters went unregulated and people could work without certification or experience. That was only until about two years ago. “Prior to the 2014 Mortuary Transportation Act, a station wagon and 25 bucks would get you a transport,” Arty said. Aside from these regulations, disposition laws have remained largely unchanged for decades. But the decision doesn’t always rest with choosing from among four postmortem options. It’s getting the people with an interest in where your remains should go to all agree. Sometimes they don’t. And that’s exactly what happened last June in the case of Nancy Porter. Heather Sinclair with her grandmother Nancy Porter at Sinclair’s graduation in 2003 from Parkside High School in Salisbury, Maryland. Nancy Porter was a Long Island, N.Y., girl before moving to eastern Maryland with her family when she was a teenager. She met Ronnie Bowden, a farm boy from Delaware, at a Kingdom Hall of Jehovah’s Witnesses in Salisbury, where both their parents regularly worshiped, and married him at her grandparents’ house in 1964. Porter and Bowden filed for divorce in 1979. “She was used to the hustle and bustle and I was from a more quiet place,” Bowden remembered. Porter was a bride five times in her lifetime; Bowden remarried in 1980. But pulled chicken parts are not what Porter will be remembered for, nor the accounting job she had afterwards. It’s the legal loophole explored after her death that got one state legislator’s attention. When Porter died on June 2, 2015, at age 68 at Peninsula Medical Center in Salisbury after suffering from kidney cancer, she set off a custody conflict, not just among family members, but between Porter’s granddaughter and the state. According to state law, if a person dies in a hospital or nursing home, the staff must contact the individual’s next of kin to claim the body and decide whether to cremate, bury, ship, or donate it, within 72 hours. The surviving spouse or domestic partner has first rights to their loved one’s remains. If for any reason the spouse forgoes his or her right of disposition, under Maryland lineage laws, the onus falls on an adult child, a parent, an adult sibling, a signed and authorized proxy, or a guardian. If none of these people come forward within three days, the body can be claimed by anyone willing to act as the authorizing agent and arrange for a funeral or final resting place. When Porter died, the hospital contacted the only name they had on file as next of kin, “Daniel Steele,” Porter’s fifth and final husband, of three months. None of Porter’s blood relatives were notified of her death. When Steele began plans to donate Porter’s body to medical science, her surviving relatives balked. With pressure from Porter’s family, Steele chose not to do anything, kept quiet for 72 hours, and in silence, left her unclaimed body as property of the state. Daniel Steele remembered doing simple activities with Nancy Porter at Somerset Gardens, the assisted-living home, where they both lived. Steele and Porter married on Feb. 25, 2015. According to Steele, Porter had told him that she wanted to be donated. Nancy was baptized as a Jehovah’s Witness, a Christian sect whose members take a non-negotiable stance toward giving or accepting blood transfusions. Her family insisted Porter would never have submitted her body for medical science. The only document that could have clarified everything was a will. Nancy Porter died without one. Written or typed, a last will and testament is the indisputable voice of the how a person wants to distribute his or her property after death. Even though 95% of Americans believe that wills or estate-planning documents are important, according to a 2015 Everplans survey, nearly 66 percent of adults don’t have one. Maryland recognizes all wills or advanced directives if the party is at least 18 years of age and of sound mind, and it is signed by two witnesses, according to the Maryland State Bar Association. Sinclair was not aware her grandmother didn’t have a will until after she died, but the granddaughter said she wasn’t surprised. “(People) don’t want to deal with death, they think they have forever; and that was like my grandmother, she thought she was invincible,” Sinclair said. Four human hearts embalmed in silicon and laced with cobalt blue arteries, sat like paperweights on his desk. There’s a showcase with an arm stripped to its humerus which rested on the top shelf of his armour. A floor-to-ceiling Egyptian sarcophagus behind his desk stared toward his volumes of law books, filled with amendments and codes he’s memorized during his 40 years in the business. Ronn Wade, director at the State Anatomy Board, saw over 2,400 corpses come through the doors at the University of Maryland School of Medicine in Baltimore in 2015. In his line of work, he’s required to deal with grieving relatives, maintain a sterile environment and find the most efficient way for the state’s dead to serve the living. Since 1973, he’s witnessed countless cases in his dual role as one of Maryland’s most experienced morticians and a liaison to grieving families, but Nancy Porter’s case stuck out to him. On June 16, 2015, two weeks postmortem, she received authorizing agency to claim Porter’s corpse. 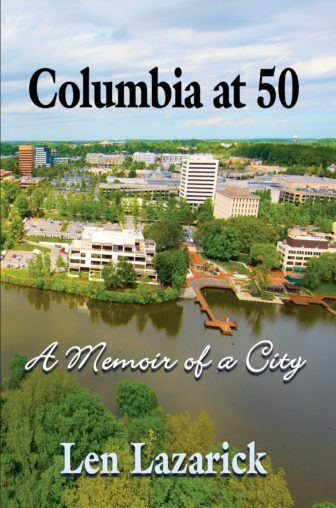 By the time Sinclair drove from her home in Queenstown to the University of Maryland Medical Center in Baltimore and drew back the plastic covers, she was mortified. “I pulled the sheet back and she was mutilated,” Sinclair said. Although Wade did everything he could to postpone Porter’s donation, he couldn’t prolong the natural course of body decomposition. “It only takes 12 hours before it’s not so pleasant,” Arty said. Regardless of whether a body ends up being claimed, the first thing Wade does when he receives a body is take a blood sample and test for infectious diseases like HIV and hepatitis. He then drains the body of fluid and replaces it with phenol, a strong disinfectant and embalming fluid that swells the tissue and turns bodies “puffy,” as opposed to formaldehyde, which isn’t very disinfecting but retains body features. Wade disinfected Porter with phenol, so when Sinclair claimed her from the 14-degree Fahrenheit freezer more than three weeks after her death, Nancy did not look like Nancy. “She was mummified,” Sinclair recalled. Porter was cremated two days later, because her body wasn’t suitable for a wake. Her remains are in the wooden box, perched in Sinclair’s kitchen on a baking rack beside flour, sugar and other spices. “She loved to cook,” Sinclair said. What if I’m on vacation when my relative dies; will the state just take him for science? Students from The Community College of Baltimore County crowd around two donated bodies at the University of Maryland School of Medicine, April 5, 2016. They wear protective face gear to protect themselves from formaldehyde that can cause upper respiratory problems. Capital News Service Photo by Leo Traub. Under Maryland law, if no one claims the body within 72 hours, it comes under the care and custody of Wade. On policy, Wade waits an extra 14 days to see whether any relatives come forward before preparing the body for donation. Because of Wade’s cautious approach, last year 610 bodies, about 45 percent of the unclaimed 1,339 left to the board, were picked up. Wade said the 14-day extension proposed under Nancy’s Law wouldn’t change the way they operate, since it’s already an unspoken practice. Regardless, the Anatomy Board didn’t openly support the new law. They said taking away a law that’s “successfully worked for 20 years” would foster even more disputes concerning the right of disposition, according to the association’s written testimony. Nancy’s Law did not make it past committee hearings. Maryland spends $800,000 to keep the State Anatomy Board running, but in the end, the board pays for itself by charging medical students, morticians, military units, trauma groups — even lawyers — to use unclaimed cadavers or those of Marylanders who donated their bodies for research. On a per-body basis, the cost to the state is about $700 for transportation of the body, chemical preparation, phenol-sterilizing preparation, body pouches, a three-layered cardboard cremation box and the cremation itself. But bodies can be used as many as 10 to 12 times depending on the purpose. For example, a Maryland medical school can cut open a cadaver for $140, or can pay for body sections. As part of an interagency agreement with all medical schools in the state, students get the best deal — $84 for the upper-lower torso, the same price for the head and neck. “We’re going to spend public funds, but the public is also going to get the benefit to advance medical study through the use of the body before it’s cremated,” Wade said. Every year on the third of June the Anatomy Board plans a burial ceremony for donors’ cremated ashes on the grounds of Springfield State Hospital in Sykesville. After a body is cremated, Wade holds onto the ashes for one year, just in case family members step forward and say they want them. After the year, they’re buried together with the others donated their same year. Wade will give a speech about their selfless contribution, a minister, priest or rabbi will say a prayer, and medical students will thank the families. Three hundred usually attend; there have always been tears and flowers, but also, Wade said, gratitude and closure.